Nizhny Novgorod is the fifth largest city in Russia. Closed to foreigners for many years, the city was recently included by UNESCO in the list of the 100 cities in the world contributing significant value in world history and culture. From 1959 to 1991, Nizhny Novgorod was a closed city, inaccessible to foreigners. Nowadays, it is a major centre for cruise tourism and a venue for international exhibitions. This ancient Russian hotbed for free thought, with its spectacular views and traditional architecture, is really worth a visit – even just for a day. For most of the Soviet period, Nizhny Novgorod was known as Gorky, after the famous Soviet writer Maxim Gorky. The city might no longer bear his name, but its central square does. In the square one can admire a statue of the poet and a clock counting down the days to the opening ceremony of the Olympic Games in Sochi. It is from Gorky Square that Nizhny Novgorod’s main pedestrian thoroughfare, Bolshaya Pokrovskaya Street, opens up. You can spend hours strolling down Bolshaya Pokrovskaya, so you’d better fuel up first. You can do just that at the Ochag pastry café (at 44b Bolshaya Pokrovskaya Street), where you can try one the 25 different types of small cakes on offer (at two or three cents a portion) or sit down for a full meal ($7–10). Bolshaya Pokrovskaya Street is one of the oldest streets in the city. Centuries-old buildings have preserved their allure to this day. The one with turrets, weathercocks and fairy-tale figures is the Nizhny Novgorod Puppet Theatre (at 39a Bolshaya Pokrovskaya Street). One of the architectural highlights on this street is the neo-Russian State Bank building, reminiscent of a magnificent fortress. The Folk Art Crafts History Museum is located at the bottom of Bolshaya Pokrovskaya Street (at 43 Bolshaya Pokrovskaya Street). The building is painted in the Khokhloma style – a traditional yellow and red flower and berry motif usually found on wooden crockery. The museum also houses the Arts and Crafts shop and studio, which sells products from all over Russia, including traditional Russian nesting dolls ($6 each), Khokhloma-style glasses ($10 each), folk dresses and decorated tables. At the Kladovka art gallery (at 8 Bolshaya Pokrovskaya Street), you can visit exhibitions of the work by various contemporary artists and attend art workshops. You can also buy collectible items and original decorations. The entry ticket is 20 roubles (6 cents), and you can get that refunded if you buy something from gallery – no matter how cheap. The Nizhny Novgorod Kremlin (16th century) was one of the most technologically-advanced fortifications of its time. These days, it houses administrative buildings, churches, and a military equipment museum. The upper part of the city is located on a hill that offers spectacular views from wherever you may be standing. You can spend the evening on the viewing platform at Chkalov Square on the Upper Volga River Embankment, next to the Kremlin, but you’ll have to face the 560 steps of the Chkalov Staircase to get there. Nightlife in Nizhny Novgorod is firmly concentrated on Bolshaya Pokrovskaya Street. One of the best places to go is the trendy Beryozka bar (at 51a Bolshaya Pokrovskaya Street), whose premises are embellished with birch wood decorations and nesting dolls. Shots cost $8, while cocktails go for $7. Expect to pay around $25–50 for one evening. The bouncers are generally relaxed and the house DJs are rather fond of Russian lounge music. If you are looking for something less formal and a little extreme, you might want to check out Rock-Bar (at 11 Piskunova Street). The walls in both halls are covered in posters, and you can shoot some pool or even dance on the bar. A steak dinner will set you back $12, and the beer flows for $2.50 a glass. Don't expect to find any cocktails here, though – Pina Coladas and Margaritas are not exactly hard rock! The average bill here comes to $25–30. You’re not likely to have any problems getting in, but you’ll have to pay a cover charge if there’s a gig on ($10 for men and $3 for ladies). For a more laid-back evening, you can always head down to the Bufet art café (at 14 Osharskaya Street) - dimmed lights, trance music and kaleidoscopic images on the TV screens do for an unusually stimulating environment for intellectual chats. And make sure to ask for one of barista Gusar's specialty coffees. The average bill here shouldn’t cost more that $15–20. One of the most popular clubs in Nizhny Novgorod is Z-TOP Club (at 16 Upper Volga Embankment), where you’ll find world-renowned DJs playing commercial house music. Entrance is $16, or $33 for VIP tickets. There is a strict dress code, but even if you turn up in your finest ensemble, there’s still no guarantee you’ll get in. A $100 deposit is required to book a table. Cocktails cost around $15. Every night is devoted to a different style of music. Russian and European food is served on the first floor, with Japanese and Italian food available upstairs. You can expect to pay around $25–50 for an evening here. The club has a formal dress code and decidedly discerning doormen. The historical monuments in the lower half of the city are concentrated in the area known as Strelka (or ‘spit’), a large cape formed by a confluence of the Oka and Volga rivers. Taking up eight square kilometres, the Nizhny Novgorod Fair is the largest in Russia. It is located on the waterfront (at 13 Sovnarkomovskaya Street). Its popularity during the 20th century can be put down to its advantageous position right by two of the country’s main shipping arteries. These days, it hosts exhibitions. Once in the area you might want to take a stroll down to Alexander Nevsky Cathedral (at 15 Strelka Street), with its 87-metre-tall yellow walls. 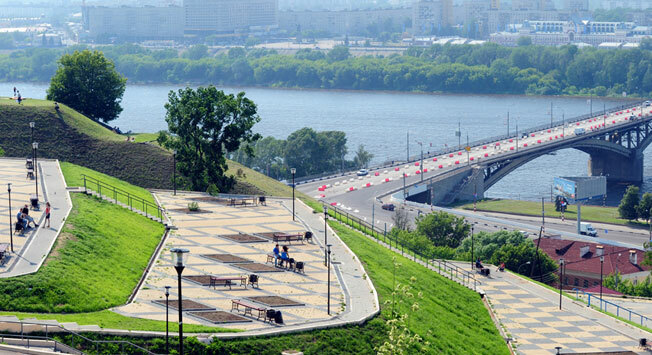 The bridge to the other side of the Oka River keeps you going along Rozhdestvenskaya Street. This location is an open-air museum with no fewer than 35 architectural monuments, the most beautiful of which being the Cathedral Church of the Blessed Virgin Mary, a perfect example of the Russian Stroganov style from the 17th–18th centuries. You can grab a bite to eat at the Gavrosh French bistro (at 45 Rozhdestvenskaya Street), where $20–30 will buy you a nice lunch. Another option is to head to Central Bar (at 23 Rozhdestvenskaya Street), a reasonably priced café-bar where the dishes are so large that you can order half-portions. The most sought-after cars of the Soviet era in the 1930s–1940s were built in Nizhny Novgorod, or, as the locals call it, the ‘Russian Detroit’. The memory of these golden years lives on at the GAZ Museum (at 95 Lenin Avenue, JSC GAZ), where you can see anything from military vehicles to the seven-seater Chaika. The museum is only open on weekdays.